Peggy Bawn enjoying Classic Week, Germany, 2010. Peggy Bawn, the fine 19th Century yacht that acted as the catalyst for author Martin Black to honour many years of research – resulting in the exquisite book, G.L. Watson – The Art and Science of Yacht Design – is a rare thing indeed. The number of surviving vessels from Clydeside yacht designer George Lennox Watson’s lifetime (1851-1904) can be counted on a careless carpenter’s fingers. Long gone are the huge America’s Cup challengers and “Big Class” racing yachts, and only two of the fleet of palatial steam yachts – the superyachts of their day – from his Glasgow drawing boards are known to survive, in fabulous condition although barely recognizable from their original appearance, but with yarns to tell of fascinating and famous owners. The company Watson started in 1873 survived his untimely death, and for three decades continued to service a demand for very large steam and motor yachts. Perhaps the finest example (and at 300ft/91m, the largest), Nahlin, survives. Launched by the famous John Brown yard at Clydebank in 1930, her epic rescue in the 1990’s, and impeccable restoration to her former glory by 2010 was directed by the present day G.L. Watson & Co. Ltd. But it is left to the 36ft/11m cutter, Peggy Bawn, to carry the flame for Watson’s ground breaking mid 1890s work in setting the standard for moderation in sailing yacht design, work that has never been challenged – only endorsed by those who followed his lead through the 20th century, especially Olin J. Stephens, who was a self-confessed Watson fan. Peggy Bawn’s gilded “fiddle” bow was anachronistic even at her launching in 1894, partly a past fad, partly practical, undoubtedly beautiful – an interim stage in the development of extending immersed waterlines for faster sailing when heeled with a more buoyant hull – but it conceals the fact that when her restoration team began assessing what they’d found in a County Waterford hay barn in 2003, they quickly realised that the “numbers” – the yacht designer speak for the various ratios that define a hull – were simply a scaled-down version of those for Watson’s famous royal racing cutter Britannia of 1893. Her name gave rise to the so called “Britannia Ideal”, as she was and is considered the epitome of sea kindliness. We can vouch for that from eight seasons of racing and cruising aboard Peggy Bawn in northern and Mediterranean Europe, and east coast USA. She is quite simply the best behaved yacht any of us has had the pleasure to sail. We like to think that the exquisite standards of quality in research, materials and craftsmanship employed in Peggy Bawn’s rebuilding also set the tone for her first publishing venture, a passionate combination of knowledgeable sleuthing, high production values, sheer good looks and a rattling good yarn. This entry was posted in America's Cup, Baltic Germany, Big Class, boatbuilders, book, Britannia, Clyde yachting, Clydebuilt, Firth of Clyde, G.L. Watson, G.L. Watson & Co., G.L. Watson & Co. Ltd., gift, Hal Sisk, Irish yachting, naval architect, object of desire, other yacht designers, shipyards, Steam Yacht, yacht design, yacht designer, yacht racing, yachting history and tagged Britannia Ideal, John Brown, Nahlin, Olin J. Stephens, Peggy Bawn. Bookmark the permalink. Please let me know the scientific basis of the huge intricate sails and rigging of the Edwardian age. The J-Class is evocative of yachting at its pre-war most opulent stage, where the towering rigs of vessels like Enterprise and Ranger would dwarf all the boats around them. In 1929 Sir Thomas Lipton issued a challenge to the Americans for the America’s Cup. It was his fifth challenge and signified a whole new era in design evolution and racing. 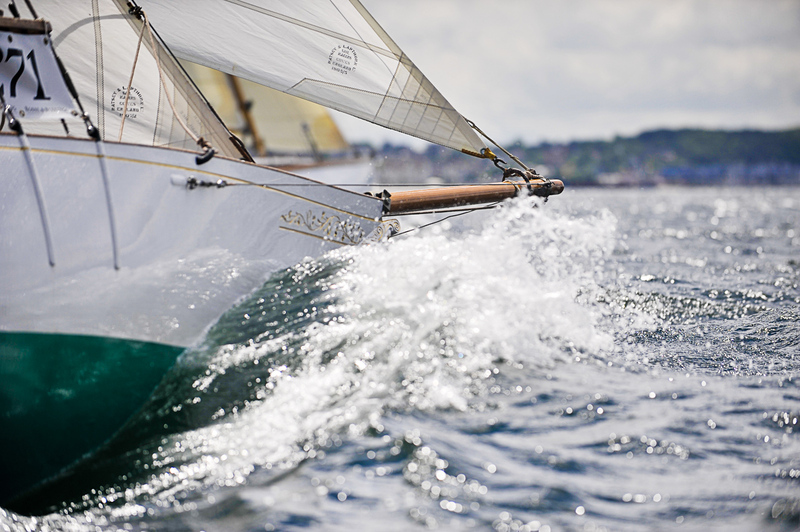 The late 1920s and 1930s also heralded the beginning of an age when yachts from both sides of the Atlantic were being raced under the same rule — the American Universal Rule. 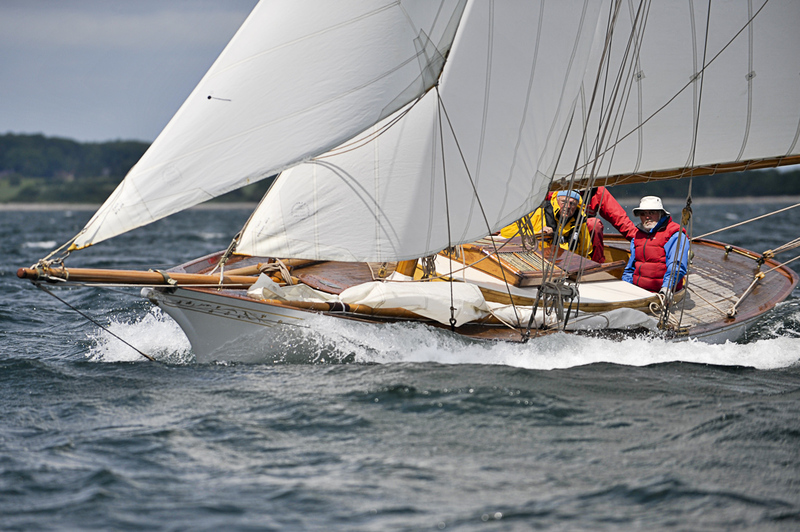 Previously, British yachts had raced under the International Rule, a rule that gave an advantage to Bermudan rigged yachts, but which was restrictive for boats bigger than 48ft. But the literature of the period is curiously silent on sails, rigging and sail handling. One reads about “tank testing”, fairest lines, bow design, transom design, keel design, centerboard design etc. etc. but very little on the science and technology of sails, rigging and sail handling. Sir Thomas Lipton may have had best designed boats, but the Americans had the experience and know-how of sails, rigging and sail handling. British racing yachts looked opulent with yards and yards of sails, intricate and complex rigging but they lacked the crew to handle these behemoths draped in billowing Edwardian finery. After Wall Street crashed in 1929, the era of super yachts with huge sails and rigging was a dying breed – they did not have the money to build new super yachts and crew them with 31 people! Mo Ahmed, Dana Point, California. The most prominent early sailing aerodynamicist was Manfred Curry, born 1899 in Germany to American parents. His book “Yacht Racing – The Aerodynamics of Sails and Racing Tactics”, was first published in Germany in 1920, with the first English language edition appearing in 1928. I don’t think that there was any primer on sailing yacht aerodynamics before that, although a very few books had been published on the mechanics of rigs and rigging, and the design and manufacture of sails. Our post, https://peggybawn.wordpress.com/2013/01/08/skulduggery-pleasant/ refers to American J-Class designer Starling Burgess’s brother, Charles Paine Burgess, who was one of many prominent American naval architects (but who worked after graduation as an aeronautical engineer) to study at the University of Glasgow in late 1890s and early 1900s. When researching that once, I had hoped to make a connection between Burgess and Percy Pilcher, the manned flight pioneer who had worked as an assistant and lecturer at Glasgow Uni’s Dept. of Naval Architecture, but Pilcher had sadly died in a crash many years before Paine’s time there. Burgess and Curry worked together on the rig design for the J-Class 1930 America’s Cup defender ‘Enterprise’, designed by Starling Burgess. William Fife designed’s Shamrock I lost to Nat Herreshoff designed Columbia; GL Watson designed Shamrock II lost to Columb(n (after corrected time) after that on 1903 William Fife designed Shamrock III lost to Herreshof designed Reliance. Shamrock III’s sail area of 14,154 square feet was no match for Reliance’s 17,730 square feet of sail! Sail handling of complex sail riggings required expert crew and equipment. “J-Boats” in the 1930s had between 7,550 sq. ft and 7,583 sq. ft of sail area though this included three jib sails – jib, jig and topsail jib. We will never again see racing yachts with 17,740 square feet of sail billowing over the white caps of the Atlantic. I guess wind tunnels were never used to test the monsterous sails – science was used mtlyos on airships, airplane wings, fuselage and prop designs all through 1920s and 1930s. Did Mr. George Watson or Mr. William Fife have acess to wind-tunnels? I believe they relied on sea trials – it is believerd the sailing crew was the biggest variable in America’s Cup races – not much is known about them either. We know Lady Dufferin of Ava launched Shamrock II in 1901 with a bottle of champagne in Denny’s shipyard! And thanks for your fascinating comments, Murshed. 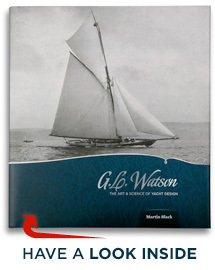 In “G.L Watson – The Art and Science of Yacht Design”, author, Martin Black, mentions references to model sailing trials – during the designing of ‘Shamrock II’, 1900-1901 – held on Loch Lomond, tantalisingly briefly alluded to in the Denny of Dumbarton publicity book “Denny, Dumbarton, 1844-1932”. He also refers to a comment by Watson’s understudy, J.R. Barnett, about “exhaustive… sail trials”, as well as the better known tank testing. We know no more, but would love to! Martin also describes how, in ‘Shamrock II’, G.L. Watson had moved to a higher aspect rig than previously used, and, working together with William Fife III, re-rigged ‘Shamrock I’ in a similar fashion for the 1901 tune-up trials on the Clyde and Solent. As in modern times, an America’s Cup budget allowed such full scale experimentation. There are many many more jucy America’s Cup tidbits in the book: “myth-busting!”, enthused Classic boat editor, Dan Houston. Have a look for my email to you about your Denny apprenticeship. Mankind has been fairly unsuccessful in trying to harness the wind. Windmills were first used in 7th century Persia. They appeared in Europe in the 12th century. Leonardo da Vinci drew sketches of windmills powered by four huge sails in 1500. In the Netherlands, windmills have stood for decades, harnessing the steady winds to pump water from the canals and dikes so it won’t flood land reclaimed from the ocean. Hindus and Buddists in Nepal and Tibet rely on the wind to spin prayer wheels which help insure that the owner will return to the earth after reincarnation as a snake rather than an ant. America’s Cup became the trophy for a competition dominated by the wealthy American industrialists of the Gilded Age like Cornelius Vanderbilt III and JP Morgan, but hotly contested by the wealthy British like Sir Thomas Lipton. As the competition heated up, the yachts got more and more expensive and monumental egos got more and more inflamed. The race of 1903 was perhaps the greatest America’s Cup race of them all. Both the Americans and British were tired of the constant challenges and both were determined to put up a yacht that would so dominate the race that the other would bow out for years. So the incredibly wealthy financed two of the most amazing sailing vessels ever constructed — the Shamrock III and the Reliance . The Reliance is the largest racing sloop ever built, measuring over 200 feet long and with more than 16,000 square feet of sail. By the rules, the ships could only be a certain length and width, and by the laws of physics, the only way to be faster was to have more and more sail. This made the yachts dangerous. “Call the boat a freak, anything you like, but we cannot handicap ourselves, even if our boat is only fit for the junk heap the day after the race,” said dapper Cornelius Vanderbilt, owner of Reliance super yacht. Reliance defeated Sir Thomas Lipton’s Denny built Shamrock III after passing Brenton Reef lightship. To save weight, she was completely unfinished below deck, with exposed frames. She was the first racing boat to be fitted with winches below decks, in an era when her competitors relied on sheer man-power. Despite this she carried a crew of 64 for racing due to her large sail plan. From the tip of her bowsprit to the end of her 108-foot (33 m) boom, Reliance measured 201 feet (61 m), and the tip of her mast was 199 feet (61 m) above the water (the height of a 20-story building). Everything else was to an equally gargantuan scale; her spinnaker pole was 84 feet (26 m) long, and her total sail area of 1,501 m2 (16,160 sq ft) was the equivalent of eight 12 meter class yachts. Later, Reliance’s the sail area exceeded 17,530 square feet. There was much speculation as to whether Reliance’s victory was due to the design of the yacht or the skill of Charlie Barr in sailing her. Lipton himself proposed to allow the two boats to swap crew after the race to decide the matter, but the offer was refused by the owners of Reliance. – Reliance’s hollow rudder filled with water from a hole in the bottom to reduce lee helm. A foot pump on deck could force air in and the water out to change helm feel. – Two speed winches below decks, with worm gears, disc clutches and ball bearings, wound wire sheets directly on drums, and were self-releasing – technology of 1903! Sail handling was crucial to Charlie Barr – the heel of Reliance gave it a huge advantage.